Again, I chose state roads out of Roan Mountain and then found I had to take a detour. That took me through Banner Elk NC, which I had hoped to see but had ruled out. Onward through Boone, and a few miles east of there I turned onto the Blue Ridge Parkway to reach my next camp. At 35 MPH average speed, and stopping at overlooks along the way, it took a good while. But, I enjoyed the leisurely pace with little traffic. I passed a National Forest camping area right along the parkway which I almost stopped at for the night. As it turned out, it would have been a far better choice than Stone Mountain State Park near Roaring Gap. I stayed only one night, even though I had planned two. It appeared the RV section was newly built, for the shade trees planted between sites were not yet mature enough to fulfill their function. It was nice enough with electric and water and level pads. But, really nothing to do there. The hiking trails were far away, as was the main attraction of Stone Mountain. I never got to see either. At any rate, this leg of my trip was a mad dash to see my artist friend in Durham NC. While there I stayed at Crosswinds SP on Jordan Lake. I arrived on Thursday in hopes of beating the summer weekend rush. It’s a good thing I did as it filled up fast with families out for some fun. Have you been doing any painting? Hey that’s too bad you couldn’t stay awhile. 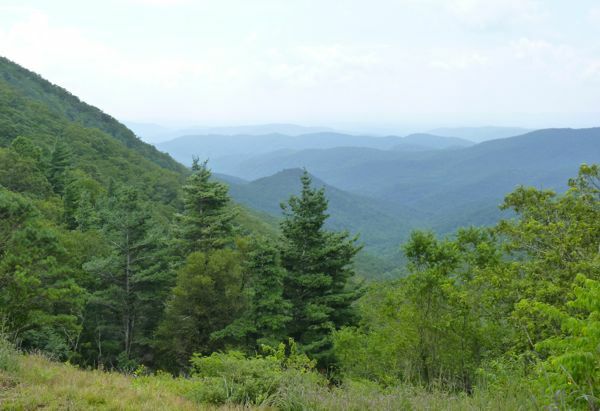 I LOVE the Blue Ridge Mountains and miss my regular trips there when I used to live in Charlotte.